Utqiagvik, Alaska, November 13 2018. Sea ice is just beginning to form offshore. The northernmost city in the U.S. continues to be ground zero for the impacts of climate change. As sunlight fades from the Arctic, sea ice began to form this week around Utqiaġvik, an Iñupiat whaling community located on the shores of the Arctic Ocean. And that’s...not right. By this time of year, the charcoal seas flanking Utqiaġvik—the Beaufort to the east, the Chukchi to the west—should have been covered in ice for weeks. Last year, the ocean wasn’t fully frozen until December. And this year is shaping up to be similarly weird. 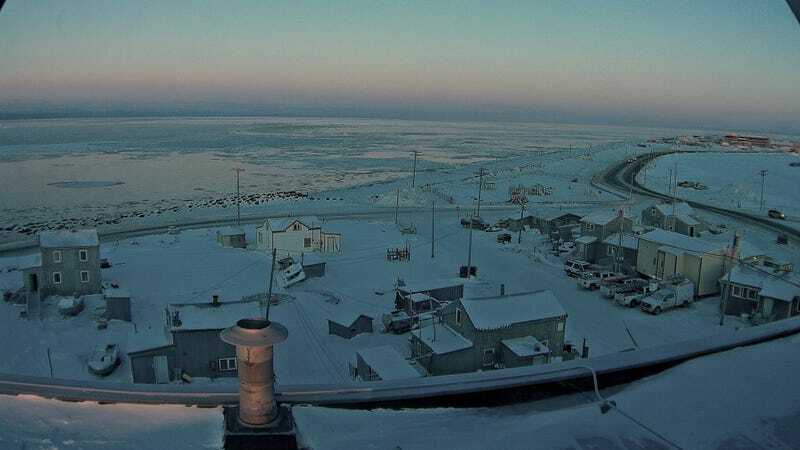 “The North Slope is well into the world of a new normal,” Rick Thoman, Alaska climate specialist with the Alaska Center for Climate Assessment and Policy, told Earther. The Arctic is warming twice about as fast as the global average, but in the 4,400-strong city of Utqiaġvik—home to some of the best meteorological records in the world—the climate seems to gone off the rails. Weather station data indicates the city has warmed 4 degrees Fahrenheit since the 1970s, with the most extreme changes occurring in the fall. Novembers are now a staggering 7 degrees warmer than they were just 40 years ago. Octobers? Eight degrees warmer on average. Rapid warming has caused sea ice across the Arctic Ocean to dwindle dramatically, with hyperlocal effects on Utqiaġvik’s ice and climate. In the old world, thick, multi-year pack ice used to come within 150 miles of the shore at its lowest extent. It would be blown to the coast by currents and winds in October, creating thick, stable platforms. But the edge of that ice has retreated hundreds of miles offshore over the past 40 years. Recent data from the National Snow and Ice Data Center reveals dramatically reduced pack ice in October 2018 compared with its historic extent (shown skirting Alaska’s North Slope in pink). “I like to say that, in October, in Utqiaġvik, we’ve had a birth of a new climate,” Thoman said. He described that new climate as “Arctic maritime,” similar to the climate off the north coast of Scandinavia, where the warming influence of the Gulf Stream ensures there’s open water year round even as the sun vanishes over the horizon for much of the winter. “[W]e’ll see if this sticks,” Jensen told Earther via email. Utqiaġvik’s ice situation isn’t quite as weird as it was last year, when the first significant ice didn’t appear until the very end of November. 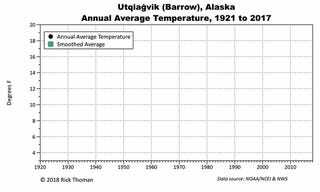 That was driven in part by incredible warmth capped in December when temperatures in Utqiaġvik rose so high meteorologists thought their weather station was broken. “We’ve exceeded that very low bar,” Thoman said of last year’s sea ice woes. But if recent times are any indicator, last year’s record low bar and this year’s still-very-unusual situation are part of a new normal. That means more shoreline erosion, accelerated loss loss of cultural heritage sites, and new challenges for subsistence communities like Utiqiagvik that have relied on the ice to hunt for thousands of years. On Sunday, the town will experience its last sunrise and sunset of the year. It’s bizarre to have to wonder whether the first sunlight of 2019 will rise over ice or crashing waves.